A six-time NBA All-Star, Amar’e Stoudamire may be new to the Big Apple after signing with the New York Knicks this past summer, but the 28-year-old center is quickly getting up to speed on life on the East Coast. When the 2003 Rookie of the Year passed through the Bell Centre earlier this season, we sat the 6-foot-10 baller down to find out what quite possibly the NHL’s biggest fan had to say. Do people often misplace or forget the apostrophe in your name? That happens all the time. Ever since I was a little kid. Without the apostrophe my name sounds like Amar-ee and that’s what most people call me at first, but it’s supposed to be Amar-ay. Was this your first time in Montreal? Yeah, it was my first time coming here. I had heard great things and they were all true. You’ve got a really nice city here. What’s the best thing about being in a market like NYC now? The coolest thing is the vibe. You just feel it everywhere you go. New York City just has its own swagger. Montreal is dying for its next Stanley Cup, but just how badly does a basketball Mecca like New York want its first NBA championship since the 1970s? Our fans want that more than anything. They’re really amped up for the team to get back into the NBA elite. Sure they want a world title, but right now I think it’s about having a playoff-caliber team willing to do whatever it takes to win. I think they want to see the type of effort and desire that New Yorkers are famous for. Amar'e never has to look far to spot his big-name fans. How different is a Knicks fan from a Suns fan? Knicks fans are all about passion. They’re really, really into the sport. 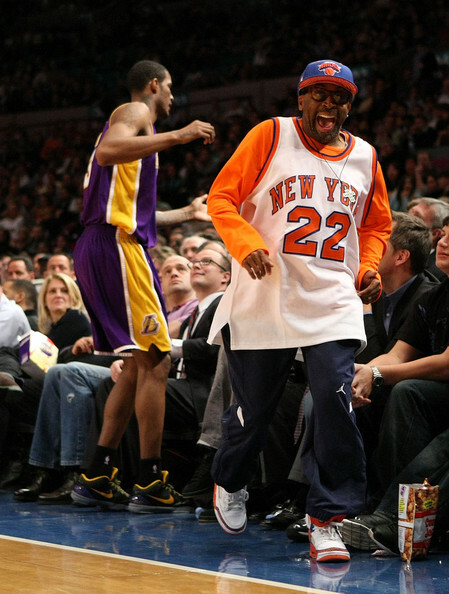 Be honest, how big a factor was having Spike Lee as your courtside cheerleader at Madison Square Garden in your decision to sign with the Knicks? You were a free agent this summer, but you signed with the Knicks with no hoopla on the first day of free agency. What do you think of what LeBron James, Chris Bosh and Dwayne Wade did in Miami? That’s a situation where those guys felt they had to team up in order to compete. I didn’t feel the need to wait and see how things were going to play out around the league. I knew where I wanted to be and I made the right decision for me. I’m my own man. How drastically has your wardrobe changed since you’ve left Phoenix? I’ve added a lot of coats. A lot of gloves. And skullies – you’ve gotta have those skullies or else it gets really cold on your head. You played with Vancouver native Steve Nash for six years – did he manage to turn you into a hockey fan during your time with the Suns? (laughs) Not really. That’s the weird thing; Steve is actually more of a soccer guy. He talked a lot about soccer. He was always trying to get me out on a soccer field. Did Canadian NBAer Steve Nash get Amar'e hooked on hockey? Did you ever make it out to a Coyotes games while you were in Phoenix? I sure did. I went out and caught a Coyotes playoff game against the Red Wings last spring. I had a lot of fun and I actually became a hockey fan that night. It’s fun to watch; the game is so fast. Those boys can move. Have you ever been on skates? Never. I’m just a kid from Florida. Who knows maybe after I’m done with basketball. The Knicks now share a facility with the Rangers. Have you gotten to know any of them? We see the Rangers guys all the time. I’ve done a few events with the goalie. I forget his name but the guys all call him Hank [Lundqvist]. We hung out at a Hugo Boss event and he’s a really cool guy, we had a lot of fun. He’s a real character. "Hank" is ready to tutor Amar'e in NHL 101. 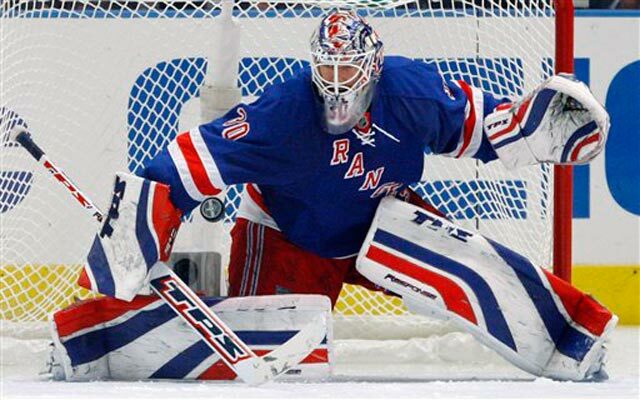 Is Lundqvist giving you a crash course in NHL 101? He’s trying to. I’m planning to learn more, for sure. It’s an interesting game and those guys do some pretty amazing things out there on the ice. I’m starting to understand the rules, too. I just need to get used to all those lines and how the blue line works with the offsides and everything. But I’ll figure it out. I’ll get there. What’s drawing you toward learning more about hockey? The strategy is what interests me. You’ve got great defenders and gifted scorers just like we do in the NBA. Seeing those guys use the puck the way they do is always amazing to me. I watch them make those moves with the puck, it’s like a crossover dribble in basketball − you’re just trying to catch your opponent flatfooted and then you just blow right by them. The NHL is known for some teams who play the trap: a boring defensive style. Under former and now current coach Mike D’Antoni you play an up-tempo game. How frustrating is it to face NBA teams that don’t run and gun? We just have to adjust. Not everyone plays that open style, especially not in the Eastern Conference. Any team that wants to be successful has to be able to play in a half-court offense. What do you think hurts more, an NHL body check or taking a charge from Shaquille O’Neal? This article, written by Manny Almela, was published in CANADIENS magazine Vol. 25 No. 3.